Over the past year we’ve worked with mobile advertising partners creating various mobile rich media ad products and HTML5 mobile ad experiences. 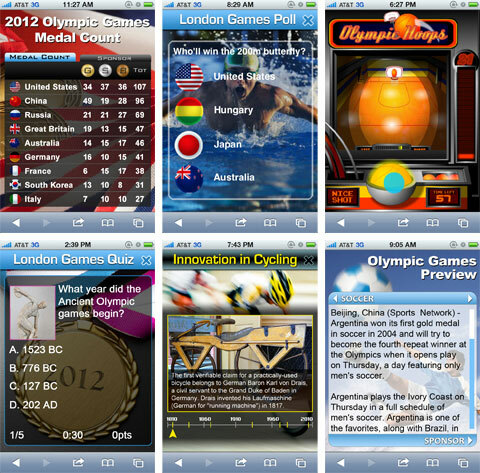 We want to share some of the latest HTML 5 and microsite concepts we created around the 2012 Olympic Games. Medal Count – Allows consumers to see up-to-the minute medal count results. Daily Previews & Recaps – Consumers received the latest Olympic news and previews of coverage and events occurring later in the day. HTML5 Mobile Casual Games – We focused on a basketball mini-game. Remember the game you played as a kid where you had one minute to take as many shots as possible? 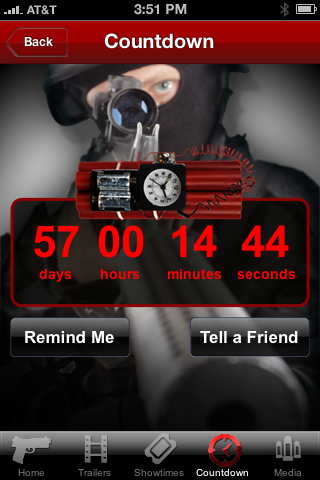 That’s essentially recreated using HTML5. Many don’t know that interactive games with Flash-like experiences can be developed with HTML5 and be deployed today. The most exciting thing about HTML5 mobile games is that they can be distributed across mobile web. This means larger reach and a larger audience. 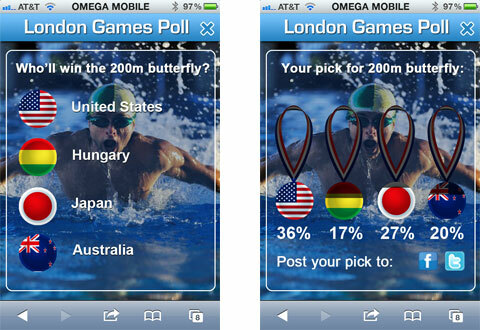 London Games Quiz – Another concept we developed is an HTML5 mobile quiz game based on Olympic trivia. Users have a time limit and the faster they respond, the higher the score gets. Users are allowed to then share and post results, as well as inviting other friends to play. Sport Timeline – In this concept we created an interactive HTML5 mobile experience where the user interacts with a timeline. As they move their finger across the screen dates, copy, and photos update as the consumer sees information about the innovation for a particular sport. This allows a sponsor or advertiser to associate themselves with any type of sport. Polling & Voting – We wanted to use polling concept that could be run throughout the day around various sporting events. Voting on who you think will win an event ties into the most common discussions people have on a daily basis. Plus you get bragging rights if you guess correctly. Polls were also targeted for specific audiences so not everyone views the same sport. Content and eesults are animated via HTML5. Advertisers can choose any type of sport to focus the polling or voting around. The experiences we’ve been working on often get served via an expandable banner ad or a mobile microsite. 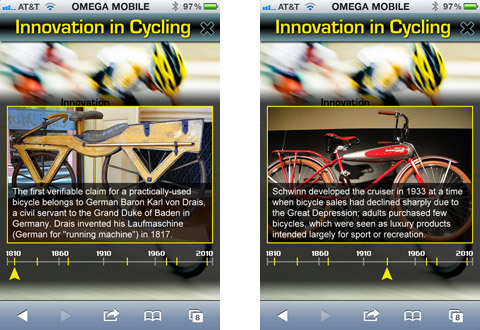 HTML5 for mobile is especially exciting in that it’s enabling wide-scale interactivity and experience over mobile web. You’ll start seeing more and more rich experiences outside of apps. Sponsors or advertisers can create custom experiences and UI components and are not relegated to standard web UI controls. HTML5 makes mobile advertising more enjoyable and encourages users to linger on microsites longer. An article in Digiday predicts major mobile interaction around the Games this summer, which gives advertisers a great chance at marketing products through dynamic microsites. Over the next few weeks we’ll be sharing more about our Olympic as well as other concepts. Stay tuned. What is it about Mother’s Day? Or for that matter, mothers in general? It seems like every time I’ve had a conversation lately about someone’s core audience, they tell me “We’re targeting moms.” Michael Kors is tapping into the mom market with a well designed mobile strategy. They are rolling out their latest and greatest with a mobile campaign targeting just Mother’s Day. 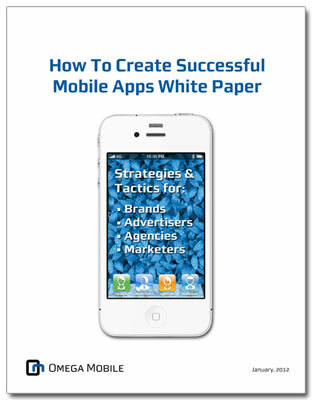 Targeting a niche market along with an event is a solid mobile strategy that offers many opportunities. As an article points out in Luxury Daily, fashion label Michael Kors is the leader this Mother’s Day on social media, particularly with a mobile based contest. Marketer John Casey pointed out, “…Next Mother’s Day, a mobile-based contest will be old news.”The article goes on to describe Michael Kors newest campaign, spear-headed with a mobile-based contest. To get the word out to their current customer base they used other social media channels such as Facebook, Twitter, and Pinterest to push the contest. Using the slogan “What She Wants,” the basic premise behind the contest is to funnel potential customers to the Kors ecommerce site which leads them to a specific area with cherry-picked gifts that mother’s would love. The idea of using a mobile based contest is not new, but the strategy of using an event or holiday to increase brand or product awareness is a good one. Michael Kors took one section of the bigger piece of market pie, and narrowed it down specifically t o those who would be interested in Kors products, and those who need to buy their mother’s a gift. By using the catchy tag-line “What She Wants,” Kors is implying that yes, of course, your mother wants a product with the Michael Kors brand. This works well as part of a mobile design strategy. Mobile niche marketing is an excellent way to push a certain type of product or service into the public’s eye but careful planning is essential to a campaign’s success. Initially you will want to examine which events, holidays, or seasons work the best for your campaign. Analyze what products will fit within the event you have in mind. If you are unsure which products, or which event might work the best, run a few test campaigns to see where you get the biggest response. You could even segment an ad and direct it to different target markets to see which demographic responds. Once you have figured out what works and what doesn’t, then consider scaling your campaign. It is essential that you get the marketing message down beforehand. The next step would be to find neighboring markets to branch into. For instance, the Kors brand might realize that men need to buy Mother’s Day gifts too for their mothers or wives. What kind of campaign would answer and meet their needs? Last-minute gift ideas, calendar reminders, and other helpful items provide high value to potential male customers. A caveat to all these good thoughts on scaling down your market: if you do not measure, you will fail. It is ultimately up to you to examine the data of your market to determine where there is a need. It’s vital to examine your analytics to see what target market you could grow a campaign with. Mobile ads and especially mobile contests targeted for certain type of individuals will garner more success than the casually flung campaign across any and all who might stumble upon it. While watching TV the other day, I noticed a Shazam logo pop up on the screen. Of course, I immediately searched and came across this really interesting Ad Age article about how Shazam’s new mobile marketing app listens to what you’re watching and serves up synchronized content on your phone. This new technology allows companies to target their mobile design strategy to what consumers are viewing on TV, creating a whole new way to think about interactive television. Back in the late 90s when folks were first envisioning interactive television, we assumed the interaction would be taking place on the TV screen. 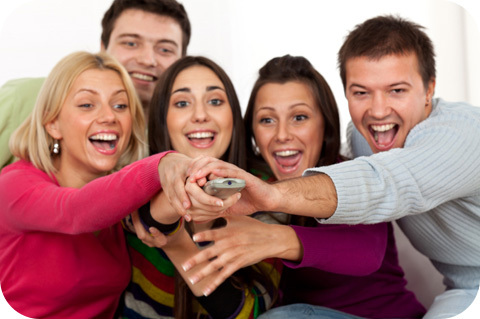 Using either a remote or a touch screen, we would engage and drive television content. What Shazam’s mobile marketing app achieves is true interactivity. It shifts how we think about interactive TV, opening up amazing possibilities for brands and consumers. Instead of interactivity taking place on one screen, it takes place on two. The content remains on the TV and the interaction happens on the mobile device, allowing brands and networks to coordinate mobile design in support of TV shows and commercials. Shazam’s mobile app works by leveraging the company’s sound recognition technology to drive interaction, solving the challenge of syncing interaction to timed content. Sound recognition provides a ‘bridge’ for perfectly syncing broadcast content to a mobile device, which otherwise would be a very complex process. What this means is that when the Shazam app picks up the appropriate words or music from the TV, a corresponding mobile experience or ad will appear instantly on your phone. With Shazam’s technology, the mobile design experience possibilities are endless. Broadcast networks, for example, can enhance a program’s content during the show itself to increase programming loyalty. The two screens, mobile and TV, can play off each other simultaneously, as opposed to being related yet still working individually. In addition, networks can prevent people from changing the channel by providing interesting experiences during commercial breaks. For example, during breaks the network might show you ads for upcoming programs and remind you to schedule alerts. They can quiz you and offer prizes. Tease what will happen after the break. Most advantageous to networks, Shazam’s mobile marketing app allows them to sell more advertising on combined units. Not only can they sell standard network slots, but they can also sell the accompanying interactions on mobile devices. Brands, too, like the interactive possibilities for an integrated rich experience. Many are designing their own versions of Shazam’s mobile marketing app to create interactivity between TV content and mobile devices. These kinds of mobile marketing apps marry television’s broad profile marketing with mobile behavioral targeting. For example, you might watch an ad on TV from an auto manufacturer. Then, based on your profile, your mobile device will provide you with additional mobile design advertising based on your specific profile and preferences. Instead of everyone seeing additional content for the same vehicle, the person will get the most likely vehicle they are interested in (SUV, luxury sedan, sports car, etc) timed perfectly to the spot on the television. Because the interactivity will make commercials more interesting, these integrated mobile marketing apps and experiences may just solve the DVR issue of consumers bypassing all commercial content. Shazam’s application of their technology is rather new. It’ll be interesting to see how many consumers embrace this type of interactivity. One thing is for sure though, the possibilities for innovation in mobile design and interactive tv have increased dramatically. Coca-Cola Freestyle is revolutionizing soda fountain machines by letting consumers mix up to 125 different flavors of soft drinks, waters, lemonades and sports drinks. Though the machine was first launched three years ago, it’s set to reach critical mass in 2012—which is why Coca Cola is launching mobile marketing and social apps to coincide with Freestyle. Their new vending concept is quite inspiring for mobile design strategies – it also shifts consumer loyalty from the QSR chain that contains the Freestyle to the Freestyle itself. 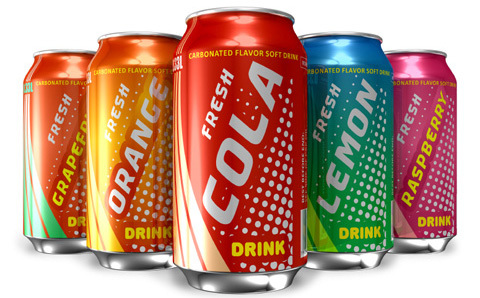 What’s most significant about Freestyle’s technology is that while consumers are mixing, the machine gathers data about consumer preferences and relays it back to Coca Cola, enabling the company to understand which flavors are most popular at particular times of the day. In this sense, Freestyle works much like a successful mobile marketing app. It gathers information from consumers while offering value to that consumer. According to an article in AdAge, the limited number of Freestyle machines out there has already been highly successful at driving foot traffic and increasing in-store sales by 20-30%. The article also states that “more than 20% of consumers said they would be very likely to switch restaurants or convenience stores due to the presence of Freestyle”. This is extremely significant if Coca Cola manages to pull it off. If the consumer experience is strong enough, consumer desire can be shifted from the fast food chain to the vending experience. For example, if Coke is doing a better job of reaching the customer via mobile, the customer will likely choose a location with a Freestyle instead of the food itself. In other words, it may not be an issue of “Do I want a burger, pizza, or taco” but “where can I get my Freestyle”? 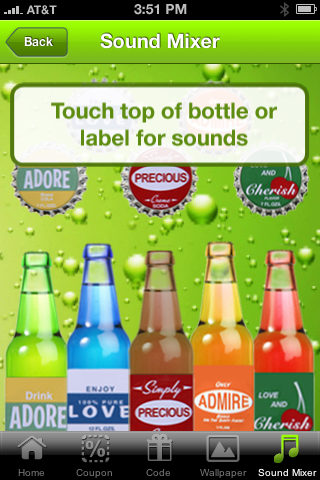 By combining new vending technolgies with mobile design strategies, Coca Cola and other companies can harness the immediacy of mobile to further consumer interaction with their own products. When using Freestyle, let users ‘check in’ on their mobile phones so you can build up preferences over time. Offer random free extras like a coupon for a free drink or a size upgrade when using the machine. Give reward points and let users redeem those points through their mobile phones. 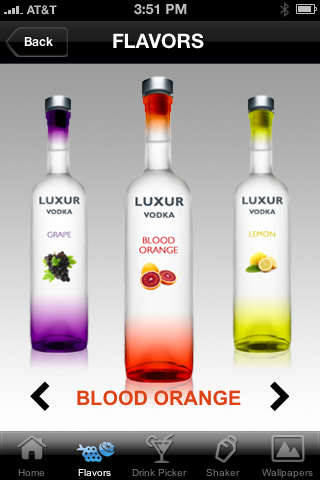 Rather than conduct A/B testing for new flavors, rotate new flavors to avoid bias and see what people respond to best. Create partner or restaurant chain promotions and see which ones work best. Test promotions then target specific mobile customers based on your data. This will boost your marketing success. Track specific individual preferences to custom tailor offers. For example, if you know a user prefers Sprite and onion rings, send him a deal for a burger, onion rings, and a Sprite. In sum, people will be loyal to the vending machine itself. A successful mobile design strategy enhances the experience by allowing consumers to share favorites, check reward points, get offers, and find a machine. 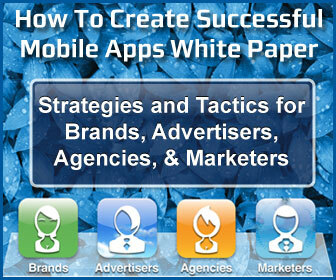 These tips go for Coca Cola and any company venturing into the world of mobile marketing apps. In my last post, I talked about how the success of QR really depends on developing a smart mobile strategy and executing that mobile strategy with good mobile design. In this post, I thought I’d further that discussion by pointing out additional factors that influence QR code success. One, you need to thoughtfully integrate barcodes into your print ad and/or packaging. Two, you need to include enticing text that explains to consumers what they get for scanning the barcode. Having a visually prominent barcode accompanied by a solid offer will lead to desired traffic. Let’s do a little experiment. Flip through some magazines and look at how different companies are using barcodes in their print communications. How often do you see a barcode by itself with no additional explanation like a simple “Scan here”? How frequently does the copy explain what you’ll get by scanning the barcode? For example, a barcode might be accompanied by text like: “Scan to find the nearest boutique” or “Scan here for a coupon”? Is the barcode sitting in the corner of the ad all by itself? Your research will probably show that most QR codes look like stickers placed into an ad with no explanation at all. That’s a big problem. Especially with new technology, consumers need to be taught what to do. You have to give them a reason to scan the code. This is where your mobile design strategy comes in. If you want to raise awareness about store locations, lead them to a boutique. If you want to increase product trial, offer a coupon. Good mobile design will entice consumers to take additional action. When I look at how barcodes are used in print ads, I often think of the barcode as a call-to-action. It’s essentially a ‘button’ that leads consumers to make a purchase or learn more about a product. But most QR codes are not being used that way. Instead, you’ll find barcodes placed in the corner of ads all by themselves. To me, this is the equivalent of using a button on a web page with no text whatsoever. The solution? Integrate the barcode into your ad and include a solid offer. The code should be seamlessly placed into the ad’s design just like any other element. It should also lead to a site whose mobile design promotes further consumer action. Going back to the button analogy, you wouldn’t put a button off in a corner of a critical web page. Rather, your whole design for that web page would center on driving the user to take action. The QR code should be similarly integrated into your print communications in a way that is visually appealing and provides incentives for scanning. 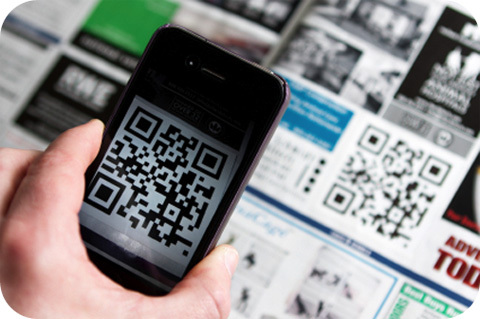 Check out this slideshow on visually creative QR codes from Mashable. I’d expect to see a lot more creative use of QR in the future as designers become more familiar with them. Then track the hits on your mobile designed site to see which incentive delivered the most traffic. There are plenty of companies who are using them correctly. According to a post on Online Spin, Home Depot and Best Buy have launched extensive QR centered campaigns, putting tags on their products to enhance the in-store experience. Also, over 45,000 new codes were created last quarter alone. Barcodes are rapidly taking their place as a viable marketing tool. The key is to use them strategically and design them wisely. You’ll see more success when the QR design experience is thought through.